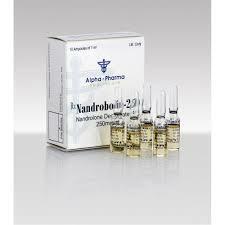 Nandrobolin is an anabolic steroid, better known as Deca or retabolil. A small amount of a substance contained in the human body, and it is one of the derivatives of testosterone. You can buy Nandrobolin on our website. It is easy to place an order, pay and enter the address. The product will be sent to you by mail, in any city you are in. According to reviews, nandrolone decanoate is more effective than testosterone drugs. It is also used to gain muscle mass, however, it is structurally different from the absence of testosterone carbon atoms. From this, nandrolone decanoate has minimal effect on the androgynous human body. Compared with testosterone, nandrolone decanoate has a minimal disruptive effect on the liver and efficacy of 50%. The drug rarely gives taste, there is about 15 days, and is injected. Do not exceed the recommended weekly dose of 400 mg. Minimum rollback. During the course, the set can be up to 8 kg of muscles. It stimulates the production of collagen, therefore it strengthens bones and tendons. It promotes the development of lubrication for the joints, something that athletes need for heavy loads. It increases the amount of oxygen in the blood. It improves the properties of the immune system. Among the side effects of nandrolone decanoate with an overdose, acne was noted, may increase pressure, headache, and swelling. Nandrolone decanoate gives a significant increase in muscle mass, but it does not provide instant feedback on the body. The increase in muscle mass is smooth, but when you stop taking the drug muscle mass disappears, as it does with other anabolic agents. The course of taking nandrolone decanoate (200, 300) is usually longer than that of testosterone, but is effective in practice. Deca Of course nandrolone is usually ten weeks. Injections are made once a week. Increase the frequency of injections is absolutely not necessary to avoid an overdose, as it is held in the body for a long time. The optimal dosage of nandrolone decanoate is no more than 400 mg. At this dose reduces the risk of side effects, while maintaining maximum effectiveness.